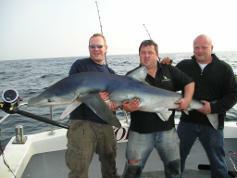 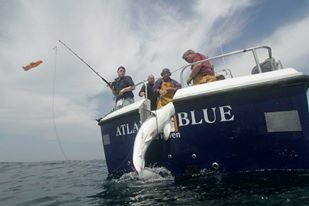 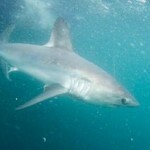 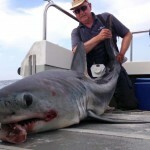 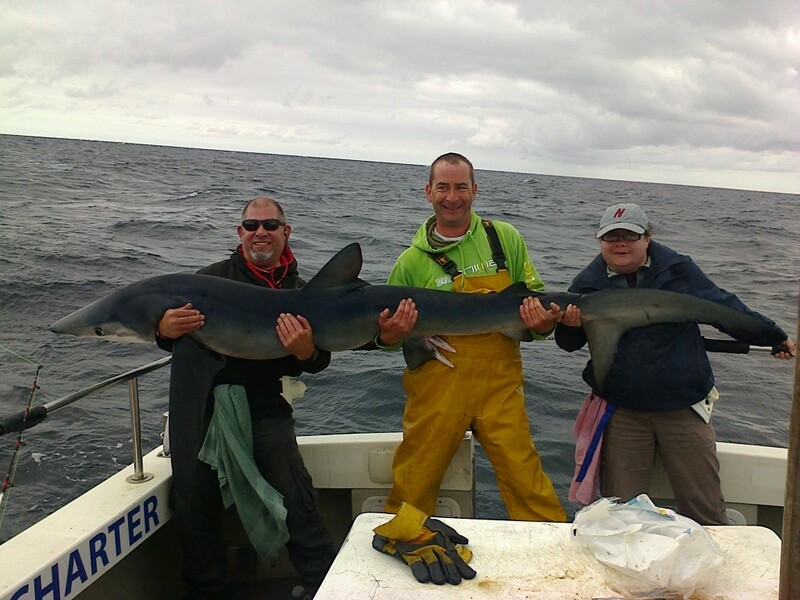 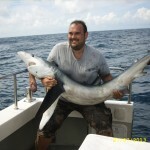 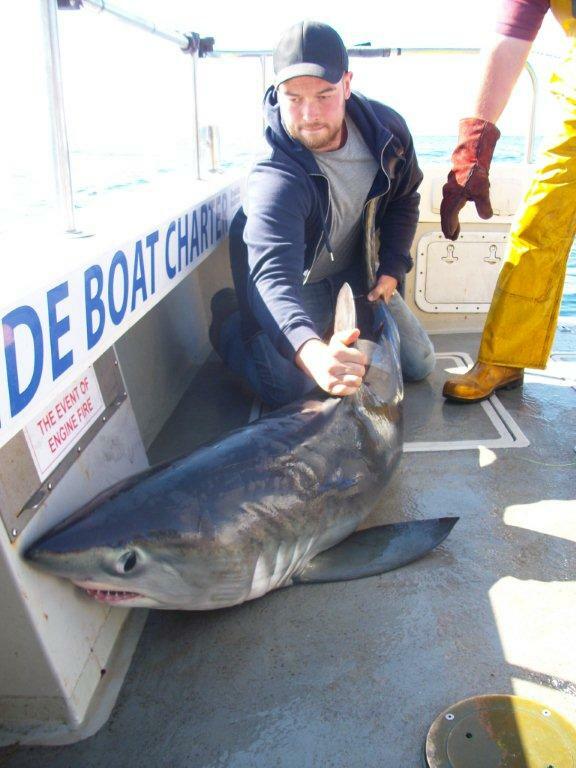 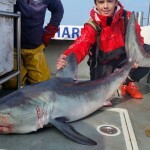 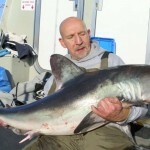 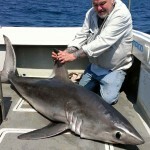 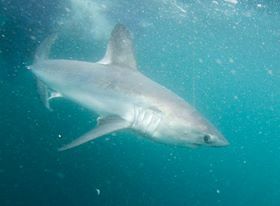 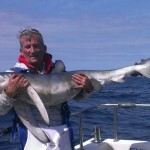 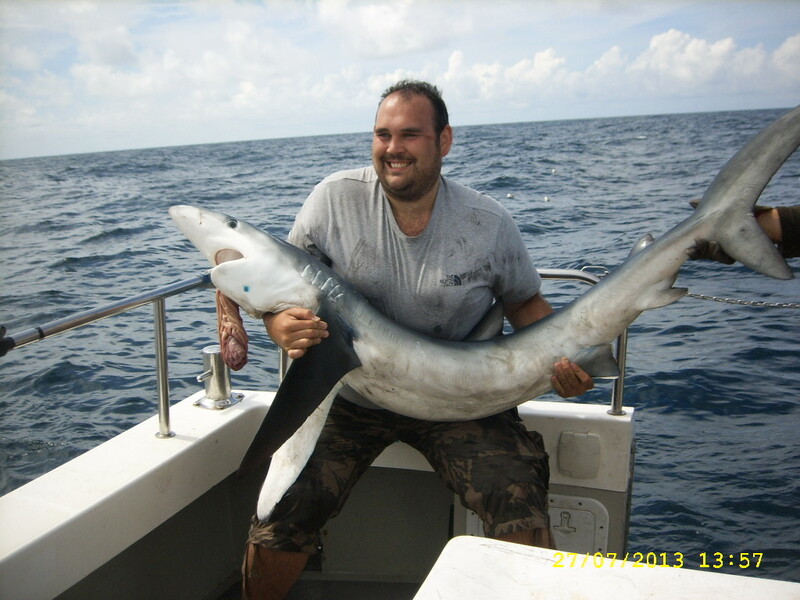 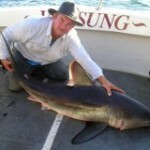 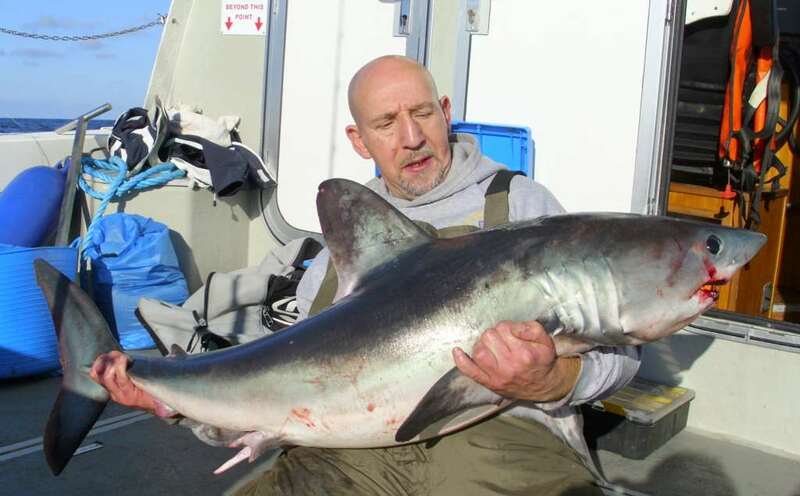 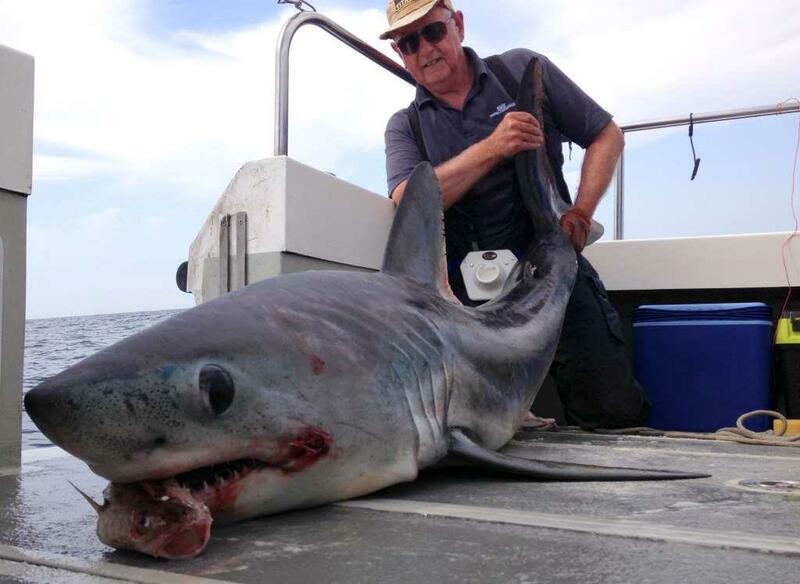 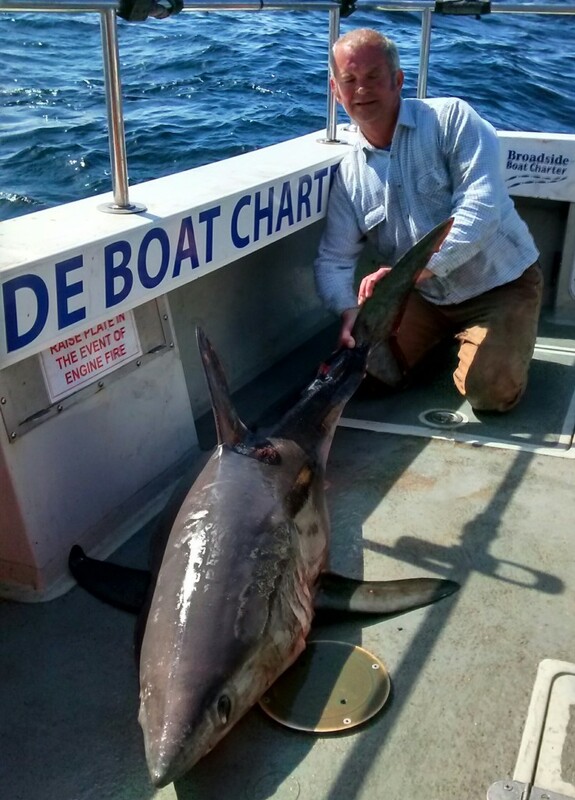 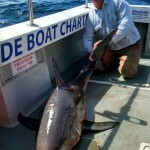 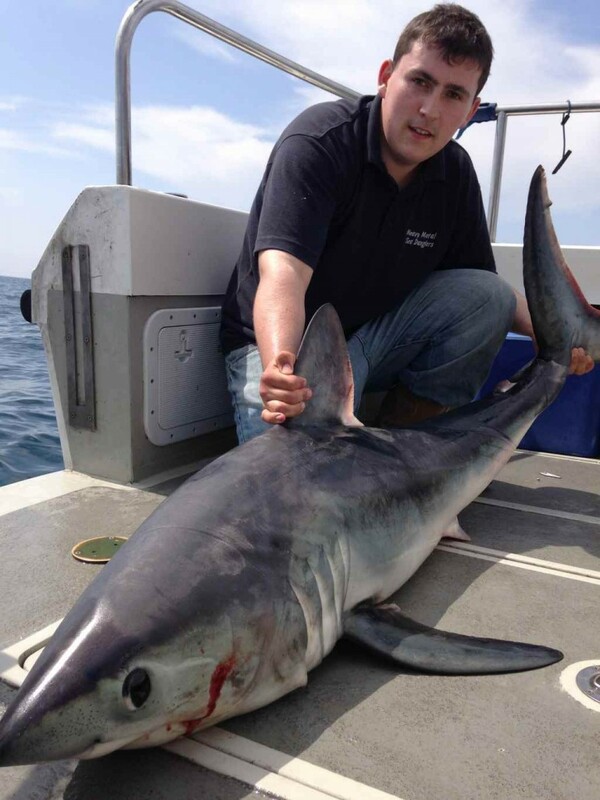 Shark charters are available from June to October. 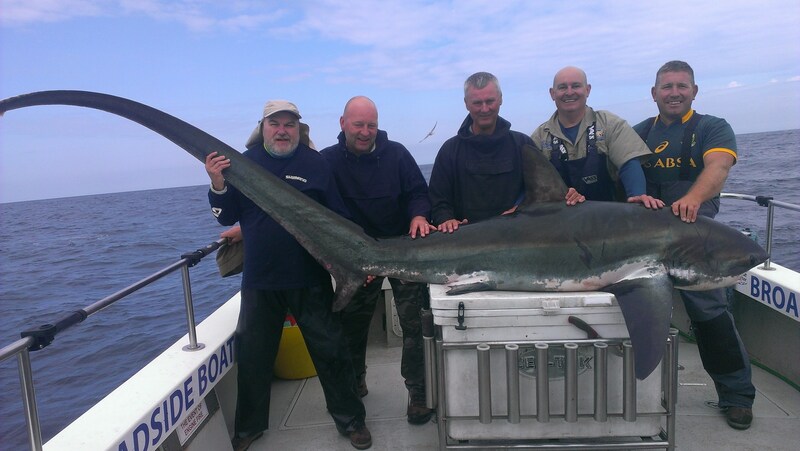 We fish up to 6 rods at a time and recommend no more than 8 anglers on board if sharing as it gets too crowded once there is a shark or two on deck. 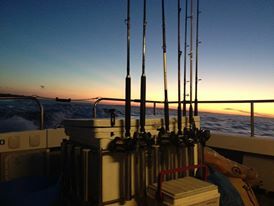 We steam to an area known as the Celtic Deep, around 30-35 miles offshore, usually leaving around 7am. 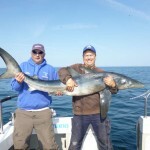 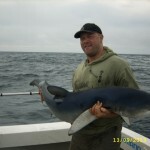 Best time for Porbeagles and a possibility of Threshers is mid June to mid July when there aren’t as many blues about. 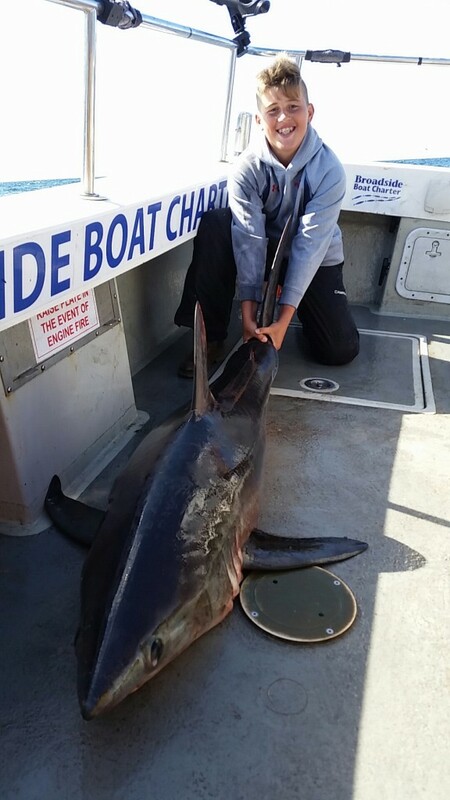 In 2014 we had a Mako and Thresher jump near the boat at the end of June and in 2015 hooked into but lost 2 Threshers before landing a beauty in 2018. 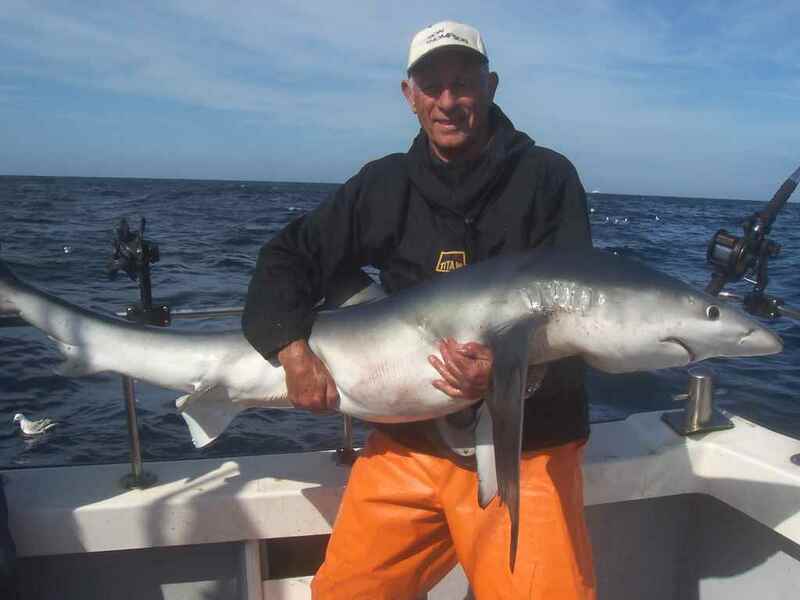 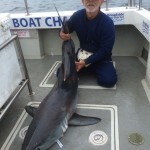 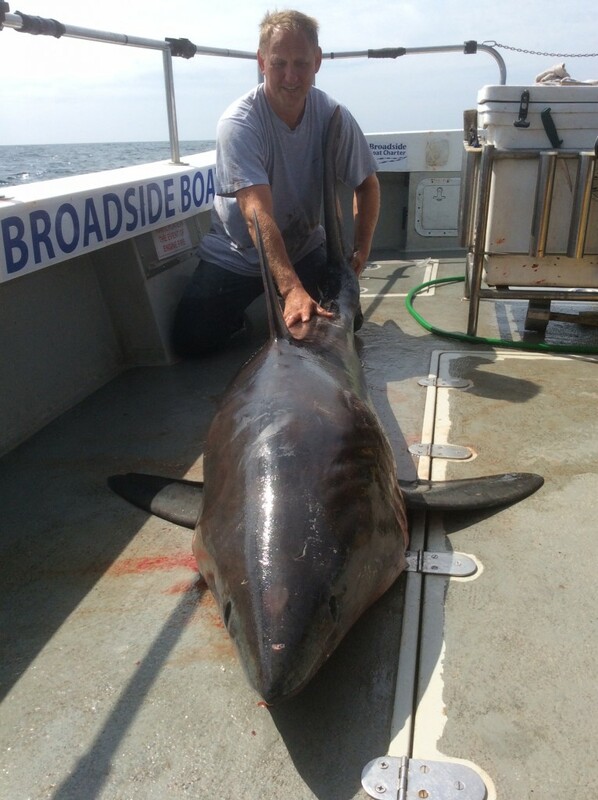 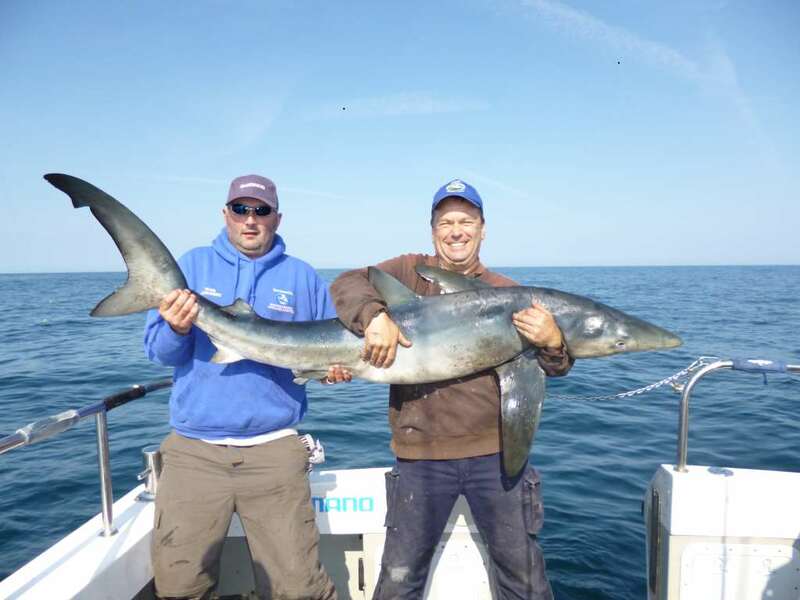 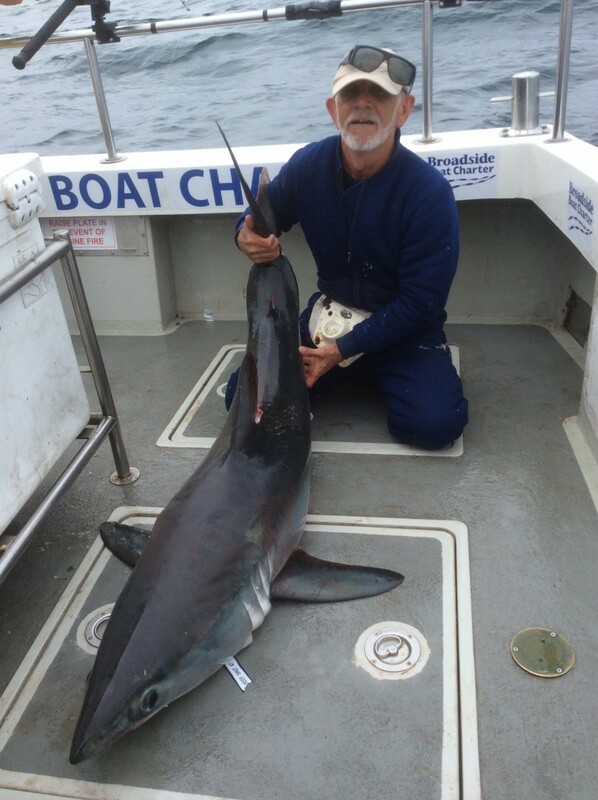 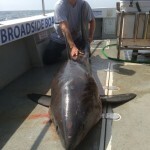 August through October is primarily fishing for Blues with the odd Porbeagle and Bluefin Tuna have been more prominent from late August on. 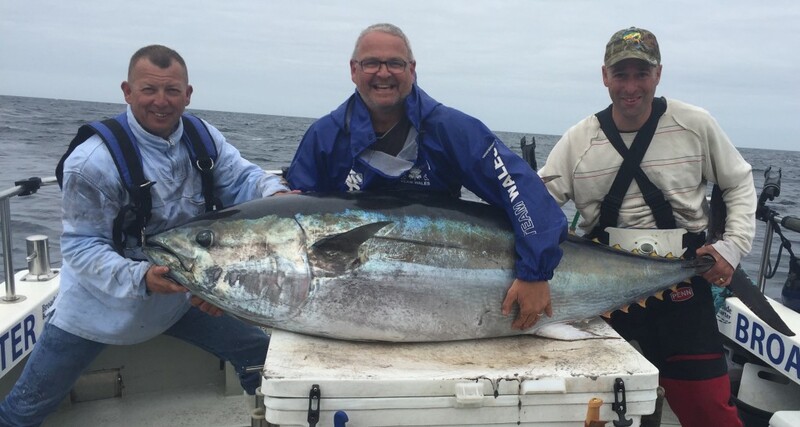 We were fortunate enough to land a 300lb fish in August 2016 and lost a couple last year. 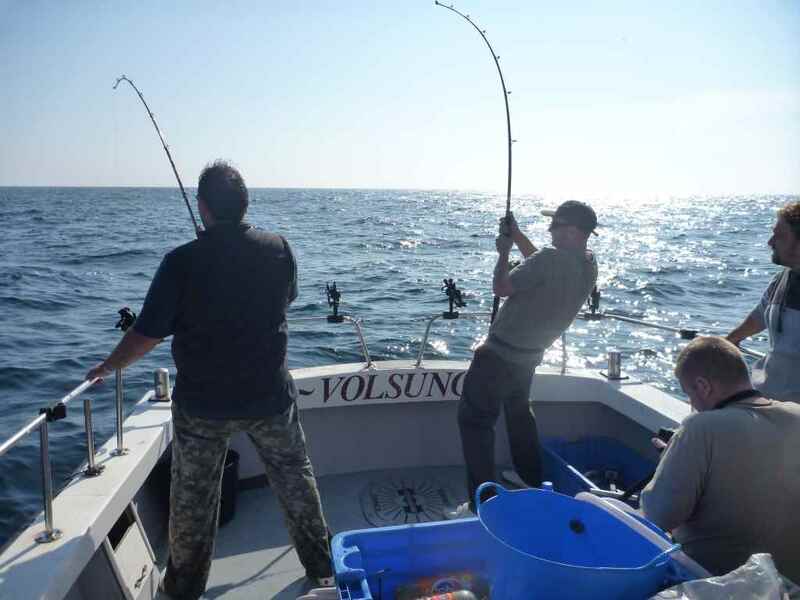 All equipment can be provided. 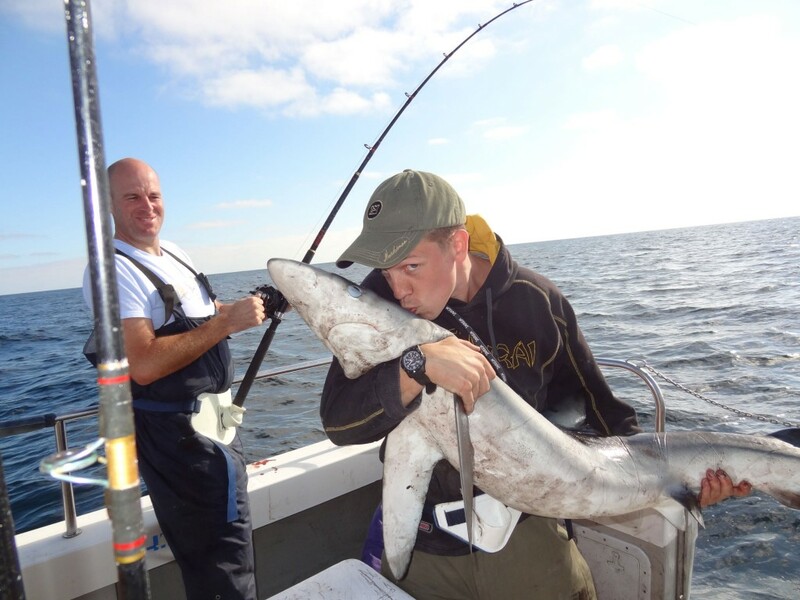 As with all local charters there is a strict catch and release policy. 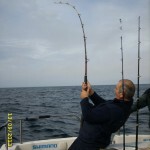 The technique is to drift fish with baits set from floats at varying depths and distances from the boat. 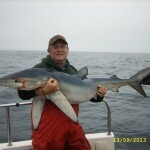 If you are thinking of bringing your own tackle then 50lb class is typical although some use as little as 30lb for blues, not recommended early season. 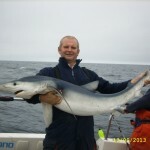 I don’t advice the use of braid main line and lever drag reels are preferable. 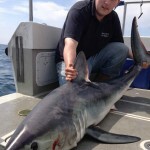 A coloured mono-filament line is easier to see to avoid tangles but I’m not sure if there isn’t more of a tendency for sharks bite through it. 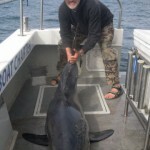 Suggested trace is a 5′ length of 350-400lb stainless wire biting trace connected by a quality link swivel to 20′ of 200+lb stainless wire rubbing trace. 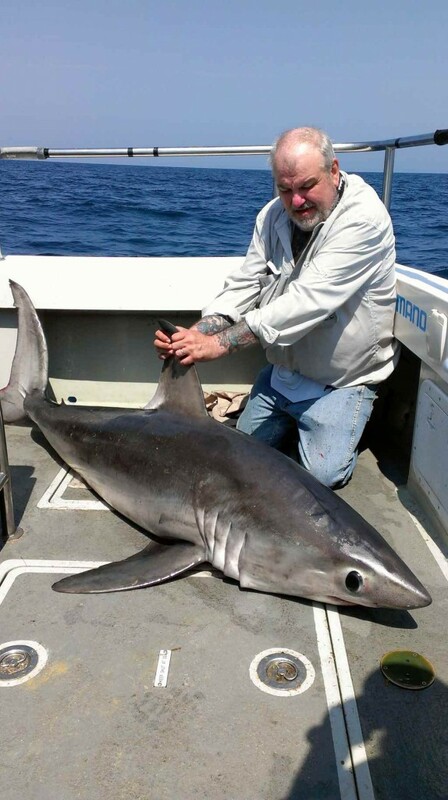 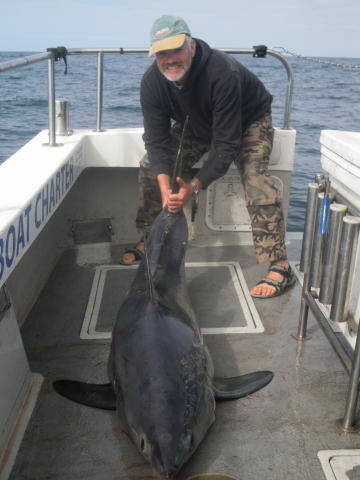 Hook size should be 12/0 or larger for a circle and of a good quality forged steel otherwise they will straighten out as the shark is brought on board. 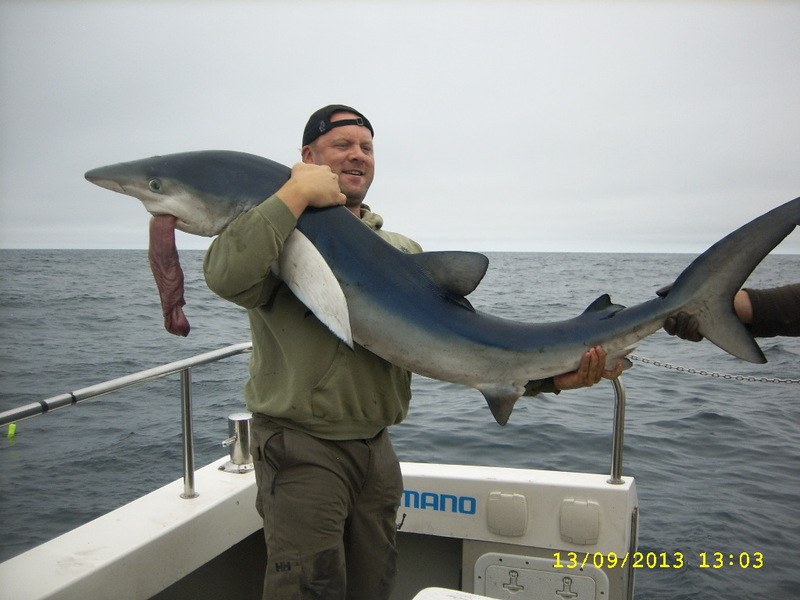 Circle hooks are preferable but still get swallowed. 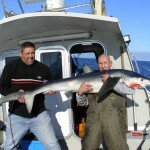 Barbs must be removed or crushed. 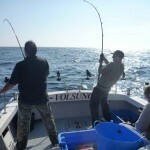 Usually incorporate a 6oz barrel weight on the rubbing trace or clip a weight onto the link to the main line. 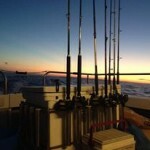 Weights are not so necessary if conditions are calm. 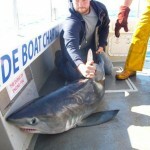 A variety of floats are used but you don’t need anything fancy. 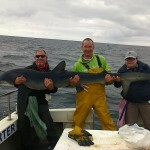 500ml plastic bottles, Mountain Dew or similar are bright green so easy to spot. 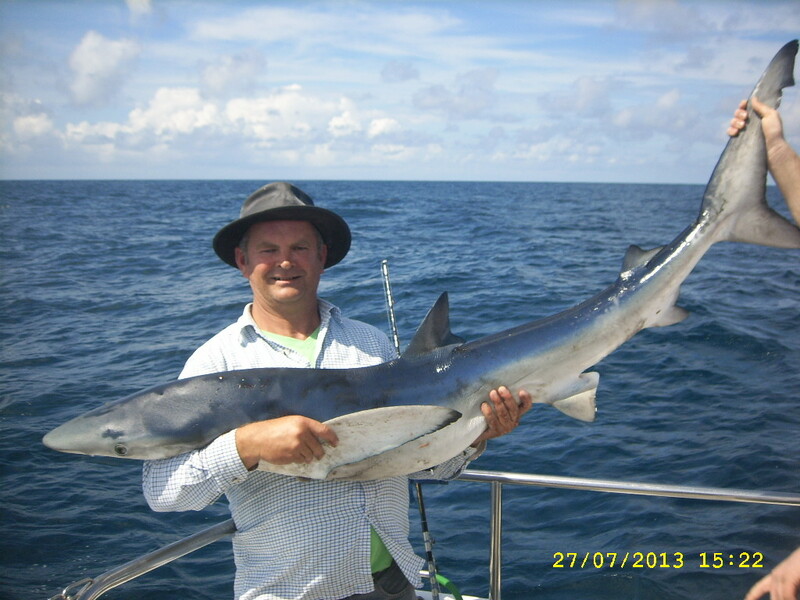 Some anglers slosh a bit of paint around inside clear bottles to make them stand out. 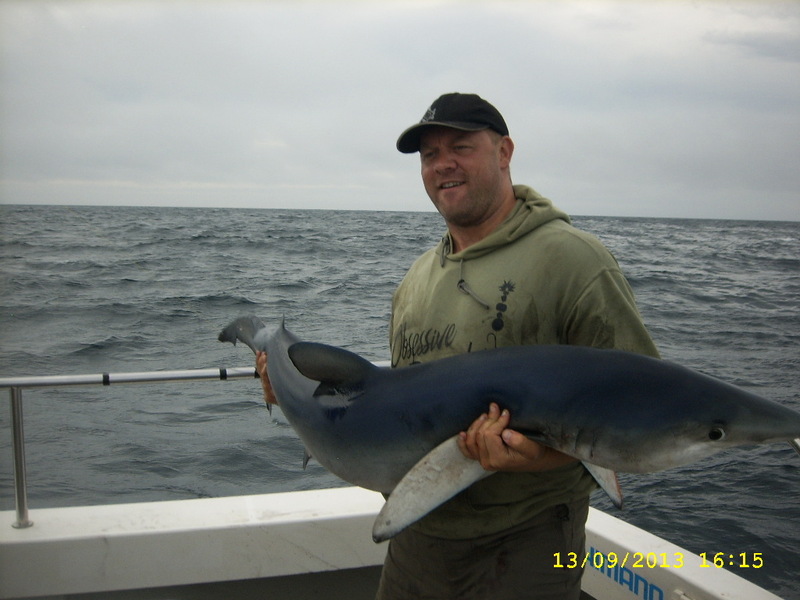 A variety of colours make identification between anglers easier. 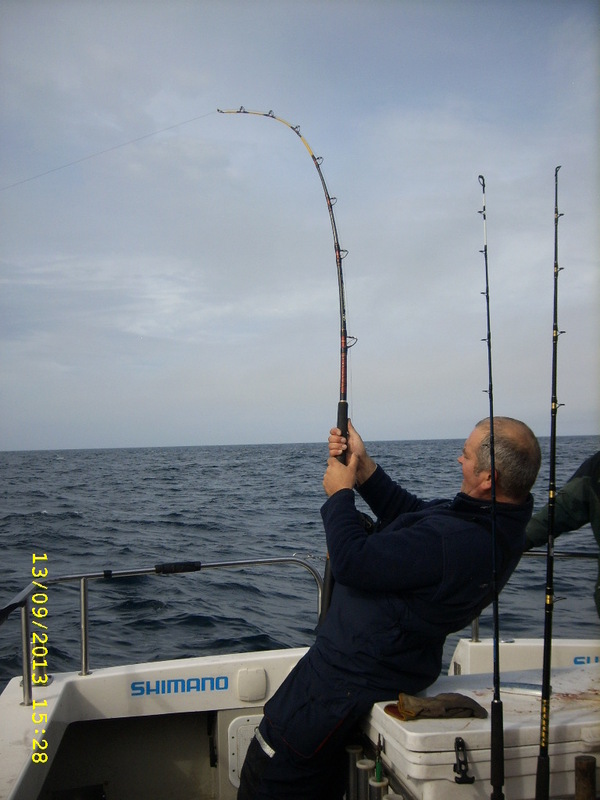 Cable tie a swivel to the neck of the bottle rather than tie them on and they don’t get as tangled around each other or your rod tip etc. 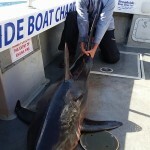 We use a zip slide on the main line (make sure the hole through the centre is not too big) and cocktail stick to fix it to the main line once the depth is set. 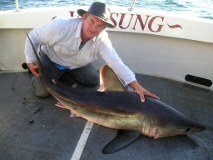 Anglers are expected to bring there own hook bait so we don’t waste time having to go out of our way to catch any. 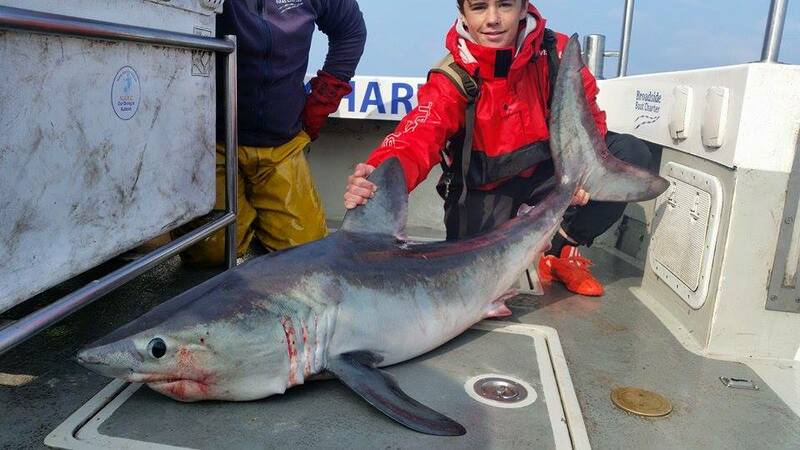 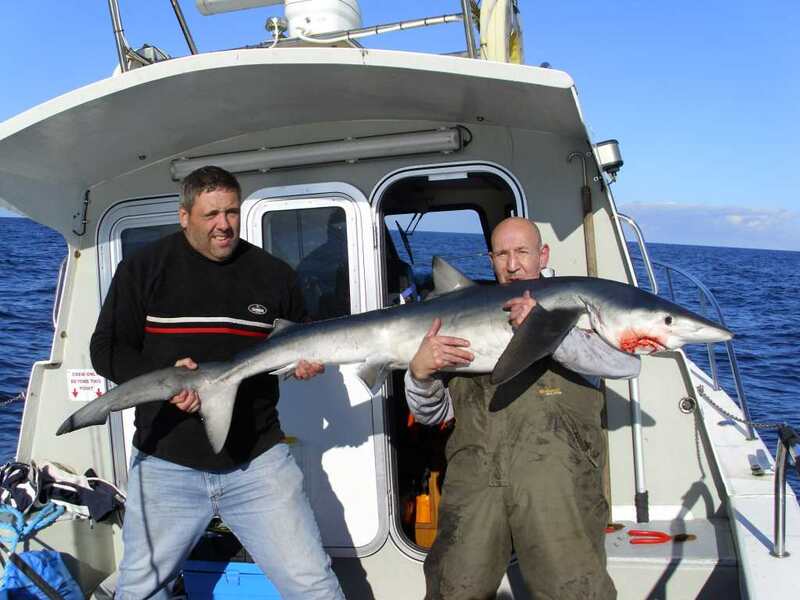 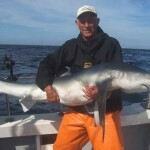 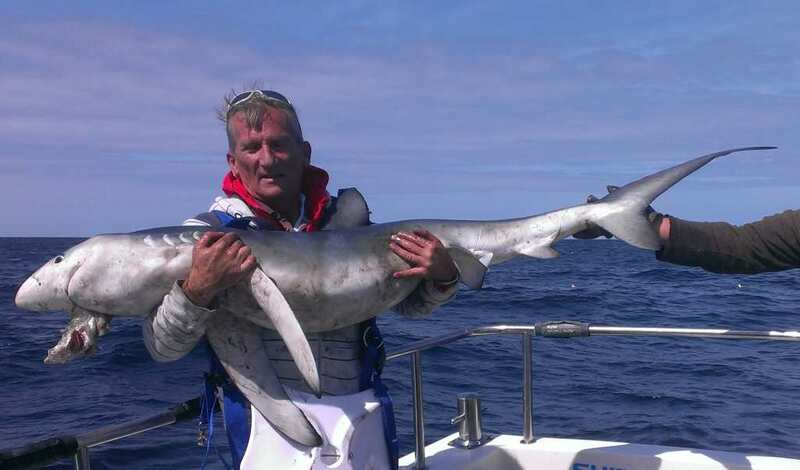 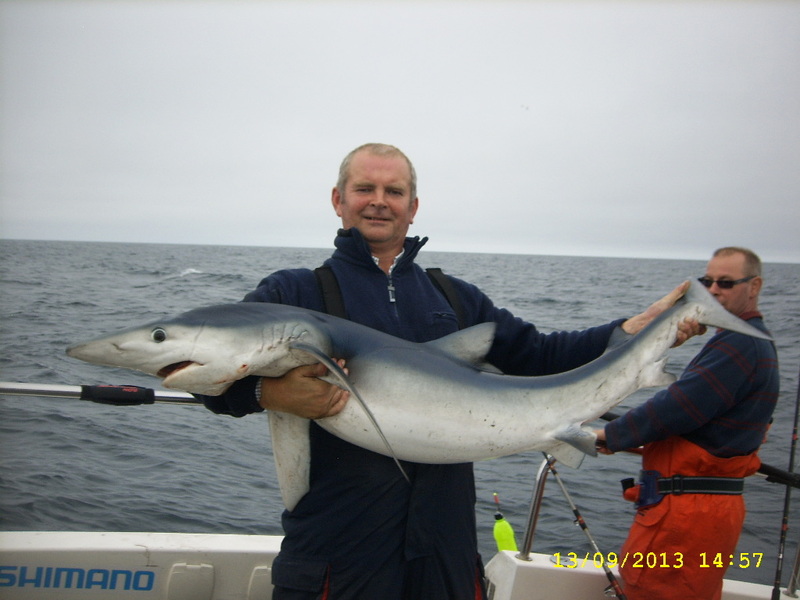 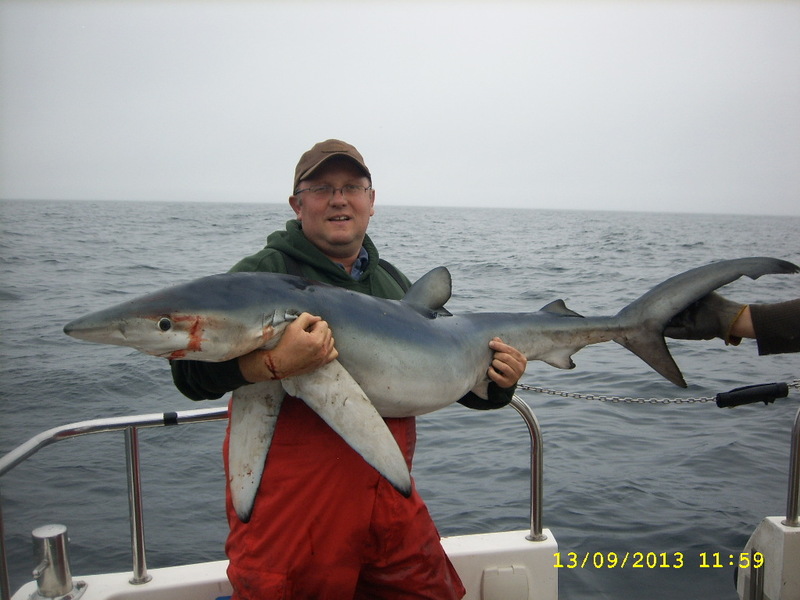 Large fresh mackerel or small pollack in the early season are ideal but the shark will go for pretty much anything. 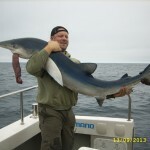 We may be able to supply frozen mackerel but the mackerel season can be very hit and miss. 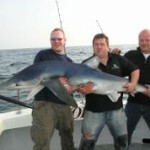 We also advice anglers to bring oily fish such as mackerel, herring or blueys for chumming the water. All the ingredients for the rubby dubby nets are provided. 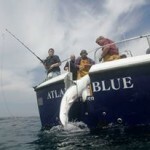 If conditions are suitable we fish the bottom for whiting and haddock as they make good live bait. 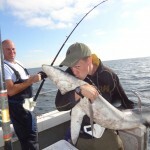 It is deep so braid is best but you still need 12-16 ounces of lead. 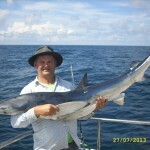 Large garfish usually patrol later in the season and also make good bait and good sport on spinning gear.